Web Japan > Kids Web Japan > Virtual Culture > Fuku Warai > What Is Fuku Warai? New Year in Japan would not be complete without the game of fuku warai, which is a bit like pin-the-tail-on-the-donkey. This game became popular late in the Edo period (1603-1868), and people began playing it as a New Year's game during the Taisho era (1912-1926). Until around 1960, people, mostly children, played this game at home. Originally, only one style of face was used in this game: the comical, round face of a woman. But over the years, other faces, reflecting the times in which they were created, came into use as well: popular actors, comic-book heroes, and so on. 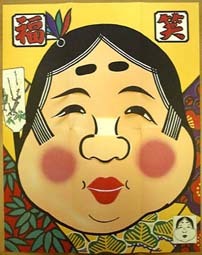 Photo: A typical fuku warai with a woman's face.